Want to go someplace Memorial Day Weekend? Now it’s easy to discover your Award Flight options to the Caribbean, to Europe, to Asia, or your favorite travel destination. 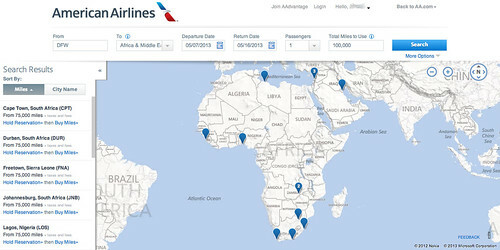 Check out this really cool visual tool that helps you figure out where you can go with your AAdvantage Miles. Just select your origin, the region you’d like to travel to, the dates, how many miles you’d like to use, the number of passengers, travel class, and then search. The map will display the results that fit your criteria. From here you can select a destination. 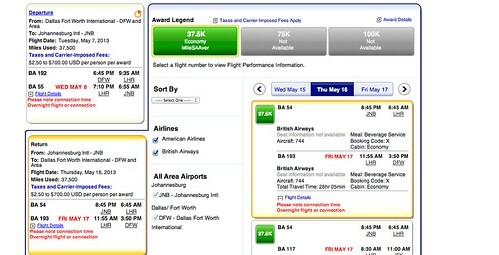 And then select flights and book an award. 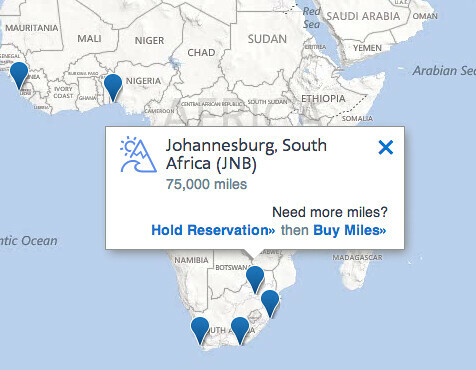 If you’ve ever used your miles to go on a spontaneous, last minute trip you’ll especially appreciate the ability to search availability by date. Another cool feature is that in addition to searching by regions, you can search by interest and display golf, beach, or ski destinations. You can play with the award map yourself at http://www.aa.com/awardmap. Too many options and not enough vacation time! Sweet development. An airline actually helping members use miles vs the opposite. Thanks. This is a great new tool, thanks for sharing. Always nice to see things made easier for customers! It’s a nice feature, but it seems it doesn’t show any location for under 37,500 miles. It may be a default minimum, but there are award tickets available for under that amount.